Publish5 Help Center: Tip: What Should I Do with My APK (Android App) File? Tip: What Should I Do with My APK (Android App) File? So you have published your brand new Android App and you got your APK (Android App) file from us... now what? The recommended action is to publish it on Google Play (Google Android Market). The major advantage of Google Play is that your App can be installed with greatest ease on most Android devices through Google Play via mobile or web, and most importantly it allows you to update your App on users' devices automatically. This will be very handy if you wish to add channels, change designs or simply incorporate new features or bug fixes from us. To publish your App on Google Play, simply go here. If you wish an alternate distribution channel, GetJar offers a free option. How do I install my APK file manually? 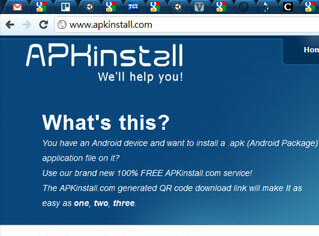 This free handy website allows users to install APK files with minimal resistance. Alternatively, you can do it the as described here in MakeTechEasier. That's it! Not too painful, but things would be easier if you App is published via Android Market - Google meant it to be the way of least resistance, and your users will have less excuse not to download your App! Nemo is the in-house designer of the Publish5 team. In his free time, he likes manually installing and uninstalling APK files. No, not really. Hi Nemo. Thanks for the information. How do we add channels on an iPhone App? I don't suppose the APK would be applicable there.